We've been waiting for the Mini SUV, tentatively dubbed Mini Crossman, and the Detroit-bound Beachcomber concept is another hint at what the small crossover will look like. At least we hope so, because this all-wheel drive concept rocks. We're still waiting on full details, but the Beachcomber appears to be a more fleshed-out version of the Mini Crossover Concept, albeit with an appearance and style more similar to the Suzuki Samurai than the old Monte Carlo Rally Minis. 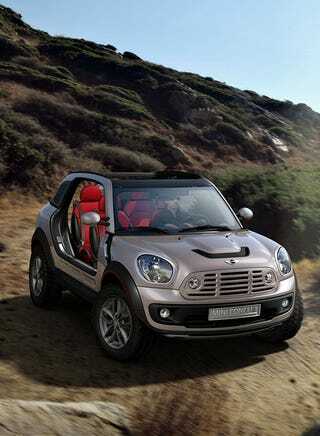 According to Mini, the Beachcomber sports ALL4, the company's all-wheel drive system. We're crossing our fingers that this is one of those concepts that's actually just a thinly disguised version of the final product, but frankly, we don't expect the final version to be this cool. Once again, MINI achieves all this by consistently expanding the model range and through the unconventional creativity of MINI design. Just a few months prior to the launch of the brand's fourth model announced for autumn 2010, MINI is now demonstrating its potential for further enhancement of driving pleasure and diversity through another spectacular concept car: the concept of a brand-new type of vehicle proudly presented by MINI at the North American International Auto Show (16–24 January 2010) in Detroit. ALL4 all-wheel drive and the variable interior give the MINI Beachcomber Concept abilities absolutely ideal for a spontaneous and active experience of freedom and leisure time. The potential offered by the car's modern drivetrain technology and space concept is used here to the greatest possible extent to ensure a highly emotional driving experience. Hence, the MINI Beachcomber Concept consistently does without doors, a conventional roof and all other body elements which might possibly limit the intensity of the occupants' encounter with their surrounding world. This makes the driver and up to three passengers one harmonious entity communicating directly with their surroundings – whether cruising through town, enjoying rough tracks in the mountains, or breezing along the beach. MINI entering new terrain – with a fourth model and a complete range of innovative ideas for the ongoing future. The MINI Beachcomber Concept symbolises the elementary values of the brand in new, radical style – and at the same time the new model continues the current development of the MINI range in a particularly attractive manner. Unique, typical of MINI, and with a great role model from way back when. The MINI Beachcomber Concept is the vision of a car leaving behind all conventional standards and creating innovative momentum for individual mobility of the future. The combination of traction optimised by all-wheel drive for excursions beyond the beaten track, on the one hand, and an extreme focus on motoring in the open air, on the other, is quite unprecedented in the world of the automobile. Even ALL4 all-wheel drive goes back to a role model from the past, to be precise a prototype Mini Moke fitted by Alec Issigonis with two engines in 1963. On this test car appropriately referred to as the "Twini", the front and rear wheels were driven in each case by a four-cylinder from the Mini range of engines. Versatile, modern, and safe at all times. Modern and up-to-date from A–Z, the MINI Beachcomber Concept offers a wide range of innovations for consistent driving pleasure in the 21st century. The outstanding know-how in automotive development of a premium car maker in the areas of design, drivetrain, safety and production technology brings together the undiluted character of the concept car with a wide range of solutions most convincing in practice. This concept of intelligent lightweight technology serves to consistently lower the car's centre of gravity in the interest of superior agility at all times. Indeed, this agility is further enhanced by another special feature also standing out through its special look, with the lateral support element boasting recesses shaped to form the "MINI" model designation. Again, this special feature clearly visible from outside particularly when looking at the car from above further emphasises the spirit of pure adventure in the open air. Extreme variability for all kinds of activities, weather and road conditions. Single seats at the rear adjusting fore-and-aft as required and with backrests folding down completely offer the passengers a supreme standard of grand touring comfort tailored to their individual requirements and allow appropriate adjustment of transport capacities for all needs. In practice, this means that the driver and passengers are able to conveniently stow even bulky sports equipment such as mountain bikes or wakeboards securely held in position by special fastening systems. Flexible protection from wind and weather: soft roof or hardtop inserts. The MINI Beachcomber Concept is built for the sunny side of life and is simply perfect for spontaneous action. Through its optimum flexibility, the car is able to meet all kinds of different requirements, naturally coping with any sudden change in exterior conditions. Typical MINI design, re-interpreted and concentrating on the essential. Thanks to its clear design language, the body of the MINI Beachcomber Concept concentrating on the essential leaves no doubts that this is a genuine MINI. Unmistakable design elements reminiscent of the brand stand out clearly at first sight. And like on the MINI Crossover Concept presented for the first time at the Paris Motor Show in autumn 2008, the new model clearly reflects the ongoing process of MINI design and the introduction of MINI design language in a new type of vehicle. Indeed, both the smooth and firm design of the body and proportions typical of MINI show once again that this is clearly a member of the range. Side view: new combination of robust strength and lightweight look. Extending far into the side of the car, the headlights additionally emphasise the short front overhang. The powerfully designed wheel arches on the MINI Beachcomber Concept boast large 17-inch light-alloy wheels and offroad tyres with a rough tread. The interior: sophisticated, versatile, robust, and full of character. The interior design of the MINI Beachcomber Concept likewise focuses on maximum driving pleasure in the great outdoors. Extra features added to the car as well as appropriate and conscious reduction to the minimum versus the existing models in the MINI range serve also within the interior to focus on the essential. The Center Speedo comes in that typical MINI design, comprising the usual display for navigation and audio functions. Strongly contoured seats and an additional handle on the front passenger's side optimise driving pleasure on rough terrain. Open-pore footmats allowing a good view of the floorpan characterise the robust ambience of the car as well as the stitching seams on the seats matched specifically to this concept car. The range of colour and trim within the MINI Beachcomber Concept again reveals the car's close link to nature, the surfaces and seat upholstery, in their design, following the elements of earth, air, water, and fire. All plastic surfaces on the instrument panel come in a newly developed grain look resembling the structure of dry earth. Center Rail with new features: everything the sportsman needs at your disposal at all times. The Center Rail already presented in the MINI Crossover Concept plays a particularly important role in the new model. Extending from the instrument panel all the way to the luggage compartment, this fastening rail connects the front seats with the rear, emphasising the common driving experience enjoyed by the occupants on all seats. The MINI Center Rail comes complete with an integrated cable duct allowing the user to connect a mobile phone or MP3 player in any position to the car's entertainment system by means of a holder fastened to the rail. A further option is to connect additional sources of light, a cooling box, a laptop or a GPS tracker safely and securely to the Center Rail, each with their own power supply. The MINI Beachcomber Concept: variable and always open for maximum driving pleasure. The MINI Beachcomber Concept offers driving pleasure in its purest form, concentrating on the essential elements required for genuine joy of individual mobility. Following the MINI Crossover Concept opening up fascinating new options through the further extension of the brand family, the potential of the MINI's modern drivetrain technology and its flexible space concept is now being used consistently to offer additional driving opportunities in a new dimension. Indeed, the MINI Beachcomber Concept offers a particularly emotional driving experience, demonstrating these qualities once again in that unique style so typical of the brand. Clear proof, therefore, that unconventional creativity still serves today to open up the door to brand-new vehicle concepts pointing into a future bound to offer even more fascinating renditions of that unique feeling so characteristic of MINI.